If you are looking to get fuel fast, we offer fuel delivery for fleet drivers all through the state of Texas. If you want to take part of the hassle of fleet maintenance off of your plate, give us a call. We sometimes like to give some helpful tips to drivers in our articles. 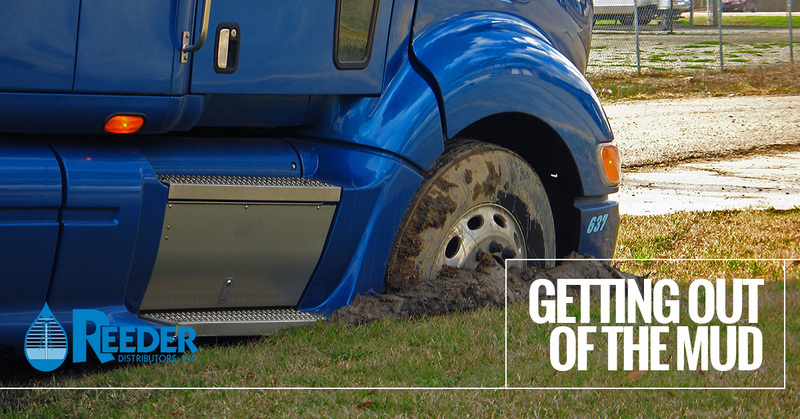 Here, we thought we’d go over how to get unstuck out of the mud. What’s a fleet driver doing in the mud? We won’t ask, and won’t tell. But to get you back on the road and back to work, here are some helpful tips. “Rocking it out” is a technique off roaders use to get out of the mud. It’s straight forward; if you find yourself bogged down in the mud, just put your vehicle in reverse and try to trace your path back to firm ground. If it works, great. If not, try angling your tires to see if they can catch any traction to get you moving toward firm ground. Failing that, you can try using 4×4 if your vehicle has it, or taking some weight out of your car before you attempt to “rock it out” again. If the mud is too thick, you can try to add extra traction under your wheels using a variety of objects. Traction mats are great if you have them, but even floor mats (be prepared, they will be ruined), rocks, boards, or logs can work. For extra traction, you can also deflate your tires to between 18 and 20 pounds per square inch. Just remember to inflate them back up again once you get out. Most fleet vehicles probably won’t have a winch. But if yours does, look around for grounded, heavy solid objects that you can use to pull yourself out. Trees work best, but some man made structures will suffice. Never attach your winch to a loose boulder, as the weight of your vehicle can cause it to come tumbling down. There is no shame in asking a passerby to pull you out (especially if you are on the job!). It is always handy to keep some webbed recovery straps or tow straps in your vehicle. You will want to attach these to the hitches, tow hooks, or the vehicle’s frame of both vehicles. Make sure you are not attaching anything to parts of your vehicle that can’t handle stress, like the bumpers, axles, suspension, hitch ball, etc. Chances are these will pop right out of the vehicle, and could even cause serious injury. When the two vehicles are attached together, the vehicle that is mobile will slowly accelerate until the slack on the straps is tightened. Then, they will use slow accelerations to gradually pull the stuck vehicle back to solid ground. The driver of the stuck vehicle should apply gas right as their vehicle starts to gain traction, while also keeping at least two car lengths from the mobile vehicle in order to avoid collision. Here at Reeder Distributors, our goal is to exceed our clients expectations. Locally owned and managed, we have been in the fuel industry for over 40 years. Our Christian values drive us to work honestly, enthusiastically, and with reverence. For more information about our fuel delivery, DEF and chemical distribution, and bulk lubricant distribution, please do not hesitate to give us a call at your earliest convenience. One of our friendly and knowledgeable staff members will be happy to answer any questions that you may have. We look forward to hearing from you!